Android Oreo adoption rate at 0.7 percent in January, Nougat climbs to 26.3 percent - AndroGuider | One Stop For The Techy You! The Android Distribution number for the month of January is out, and as always all eyes are on Google's latest Android software, Oreo. Last month i.e December 2017 Android Oreo's adaption rate stood at 0.5 percent, which was 0.2 percent increase from November 2017's 0.3 percent. In January 2018, Oreo is showing the same 0.2 percent growth and captured 0.7 percent of the Android pie. To be precise the 0.2 percent rise comes from Android 8.l Oreo, which rolled out last month to select Google devices. The Oreo v8.0 is at 0.5 percent same as last month. 2016 released Nougat is now running on 26.3 percent of active Android devices, up three percent from last month's 23.3 percent. 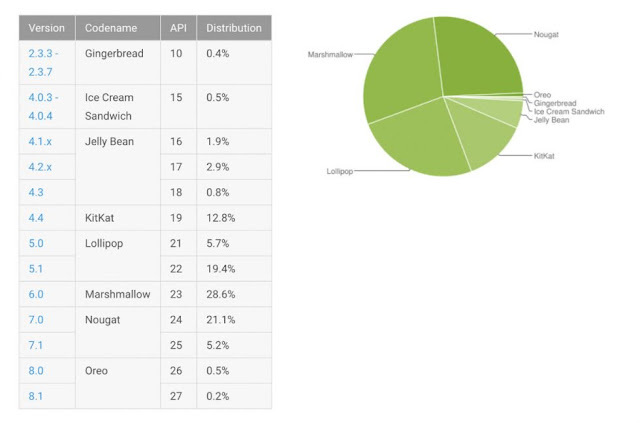 Marshmallow is still the most widely used Android operating system and is present on 28.6 percent of devices. However, it lost 1.1 percent share when compared to last month's 29.7 percent. As for the older Android operating systems Lollipop has a share of 25.1 percent, Kitkat has 12.8 percent, Jelly Bean has 5.6 percent and Ice Cream Sandwhich + Gingerbread grab 0.9 percent share each. It's worth mentioning that these numbers were gathered from devices running Android 2.2 that accessed the Play Store in a seven-day period ending on January 8, 2017. Data from devices running older Android version like Honeycomb and Froyo are not included. Also devices that don't have Google Play installed like Android phone and tablets in China, are not taken into account as well.